315 Bowery is a well-known address to a lot of New Yorkers, as it was the location of iconic rock club CBGB for over 30 years. 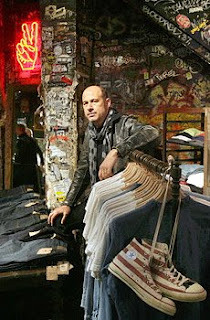 Now fashion designer John Varvatos is using the space as his newest boutique. John Varvatos Bowery is meant to merge the spot's rock n' roll heritage and the world of fashion, with offerings including vintage clothing, memorabilia, vinyl records, and 1970's audio equipment, sold alongside Varvatos' latest fashions, including a limited-edition 315 Bowery line, which will be available exclusively at the store in the fall. Not in the mood to shop? Then simply take in the graffiti- and flyer-covered walls, which remain virtually unchanged from the club's glory days.